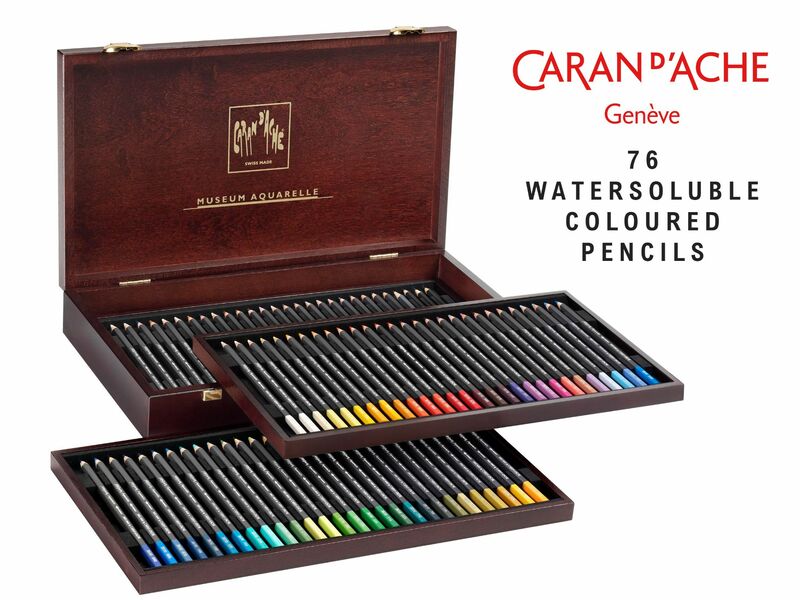 This luxury wooden box of Caran d'Ache Museum Aquarelle Watercolour Pencils contains the whole range of 76 colours. It is beautifully presented and the box contains 3 layers of pencils with 2 lift out trays. These Caran d'Ache Museum Aquarelle Pencils are made with ultra-fine, artists' pigments and have exceptional lightfastness. All 76 colours are rich and vibrant and blend easily unlike other brands of watercolour pencils. Caran d'Ache Museum Pencils have a strong 3.8mm lead which can be sharpened to a fine point and the leads are contained in top quality cedar wood, preventing breakage and spliting. This box set makes a lovely gift for a coloured pencil or watercolour artist.